We are friends of Ashish, a humble and down to earth person with an ever smiling face and unparallel willpower. 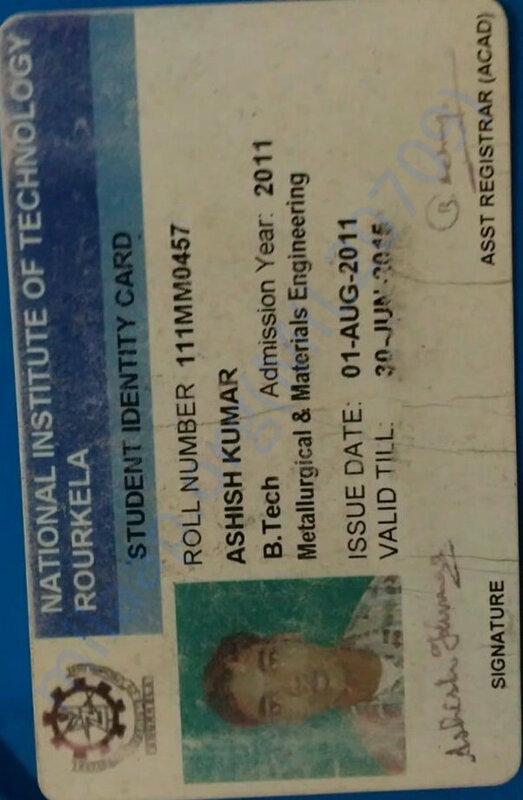 He belongs to an agrarian family from Bihar, and despite all odds managed to become an engineer from NIT Rourkela. 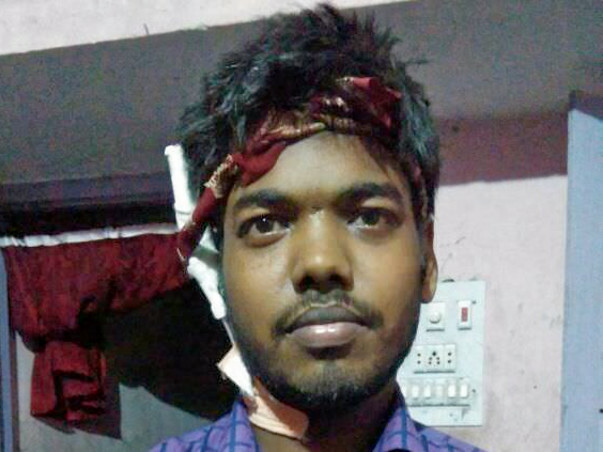 Unfortunately, he is now suffering from acute kidney failure and needs an urgent transplant. 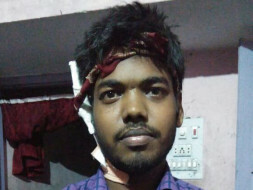 Ashish has numerous family responsibilities and is unable to bear the cost of the transplant. He has been denied any help from his company and his family has depleted all their savings during the tests and dialysis. He was getting transplant in sir ganga ram hospital new delhi. 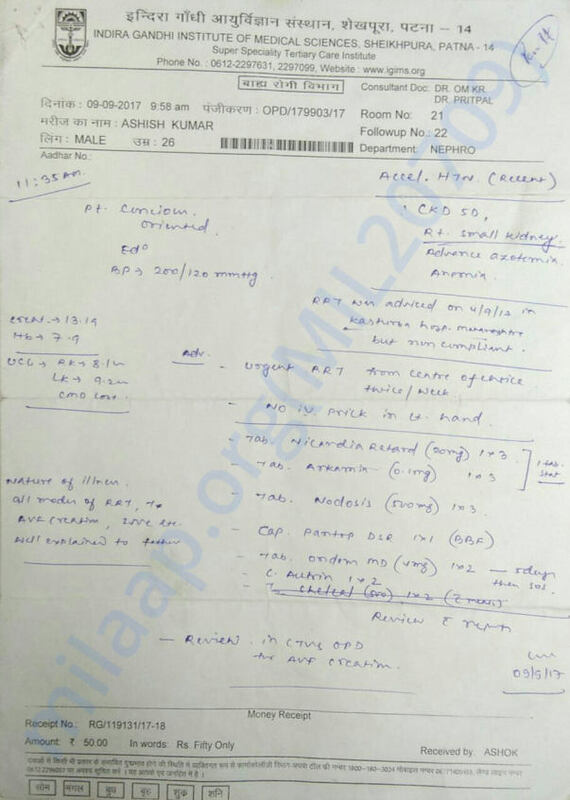 Due to blood group incompatible he needed to go through various process of antibodies decreasing method. Now he had gone through several processes of decreasing the anti-antibody A before getting the kidney transplant. 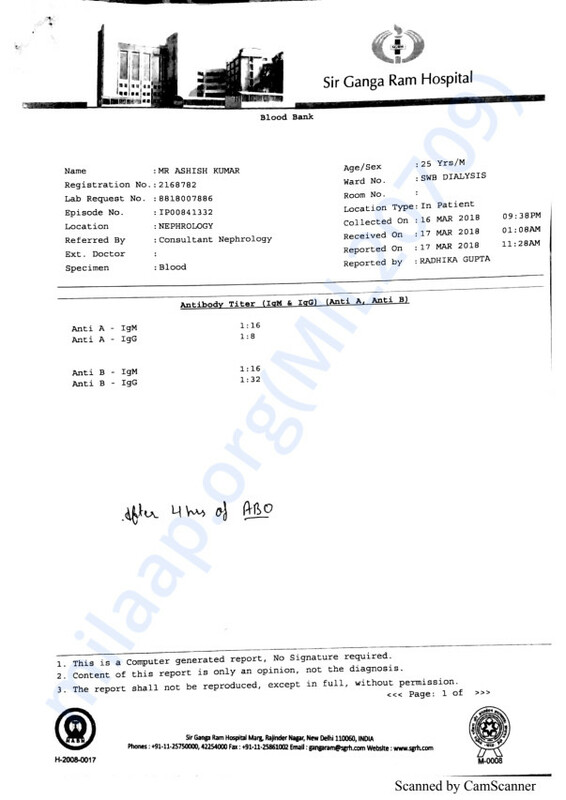 But after three processes of ABO his mother (the donor ) was diagnosed with TB. 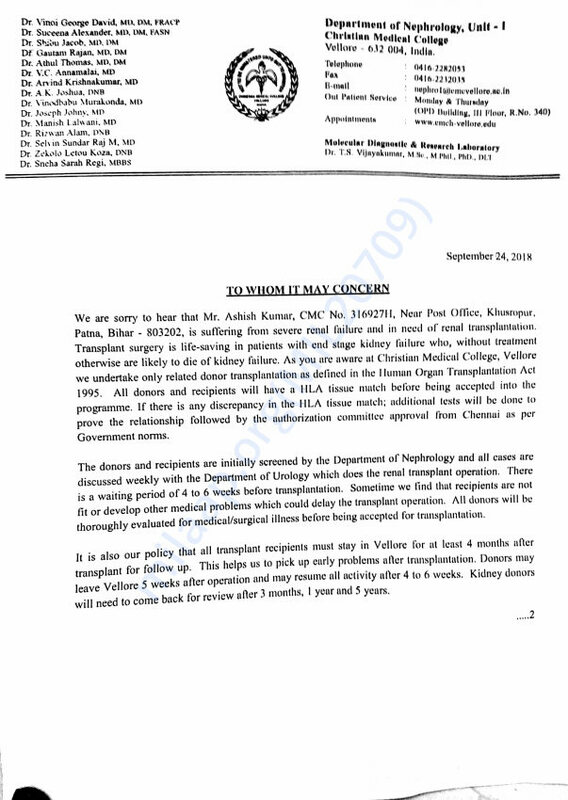 So the transplant was postponed for three months. When we were ready for the transplant in march, his anti antibody A reducing process was restarted. After again two such process of ABO( with ASDOPAK filter) his anti antibody A was not reducing. So his doctor asked him to have plasma apheresis. So after six plasma apheresis again his anti antibody was no reducing. Then his doc asked him to have another ABO filter(new one).Then again after using the new ASDOPAK filter the anti antibody A was not decreasing to the required amount. This was his last process for transplant. He was going to have transplant another day after the anti antibody comes to 1:4 . Sadly, the anti antibody A remained at 1:16. Now his blood antibody counts are increasing on a daily basis. 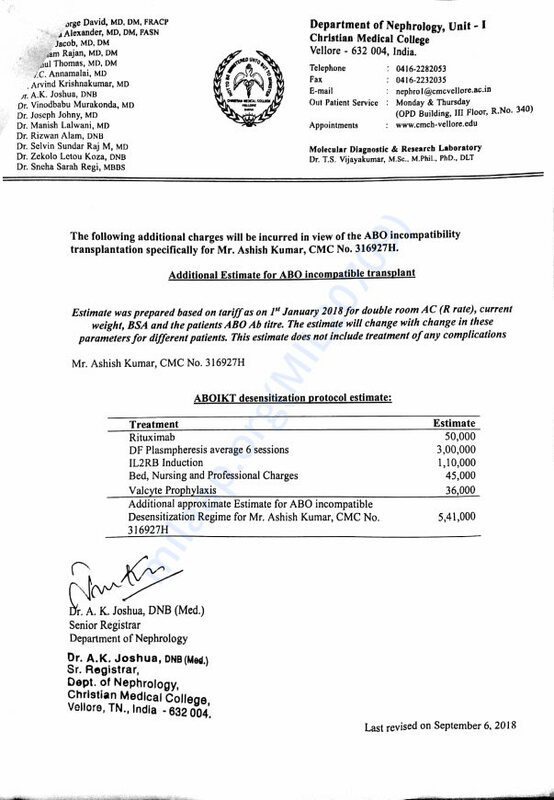 So now his consultant has recommended to use another anti antibody filter which would cost him another 3 lakh and all the process would cost 4 lakh. But before we would have started to use this new filter the donor his mother was rejected as a donor because of her severe arthritis problem. According to doctor her medicines are harmful for her kidneys. Now he is in CMC Vellore. Here in the blood test the antibodies of b blood group is less that before. According to doctor there is a chance that he can get his father's kidney. So he is looking forward for the transplant as the transplant is the only option he has to stay alive and support his family. He also need the transplant quickly because his health is degrading day by day. He also got hepatitis b infection and he always has his fistula problem. He has already depleted all of the funds which have been collected last year in dialysis and failed transplant attempt. The process of transplant was stopped in the last phase of transplant. 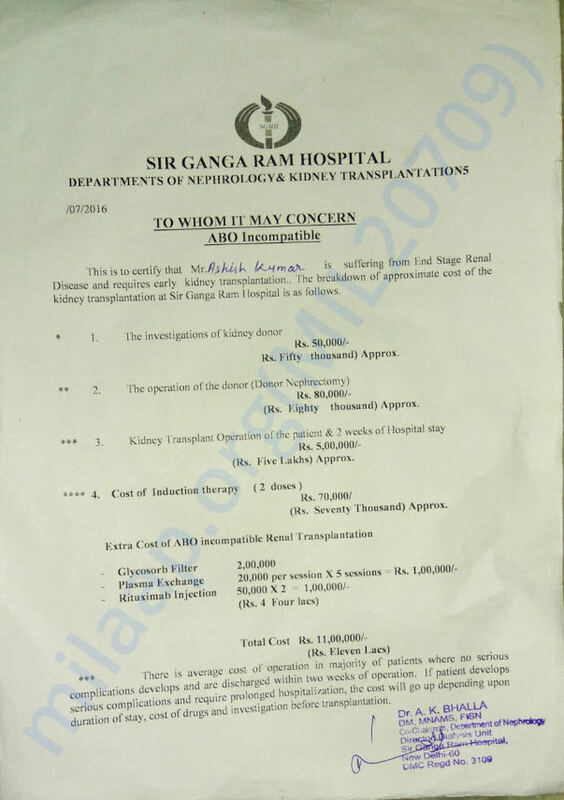 So he need a fresh round of funds of nearly 14 lac to get the transplant. This time if the luck helps him,he would get the transplant and would return to his job. In this way he would be able to help himself and his family. His problems and responsibilities doesn't end here. He has a younger brother in college and an outstanding education loan. Even he doesn't have a proper house to live in. His house is of tinshed. His father is a senior citizen and don't earn that much as to support his son's medical expenses. He is relying only on us for the transplant. No contribution is small, and we will be very grateful to you for aiding Ashish in the battle. Please spread the word as far as possible, and reach out to us if you need any more information. Its been a long time since I have given you any update on my health. Last time I gave an update when I was in CMC Vellore. I visited there to consult doctor to understand if my father could be my donor. As my father have gone through a prostate surgery in June 2018 and citing his age the doctor has advised us not to go for transplant. Instead he advised me to remain on dialysis since there is lot of risk in transplant and our financial condition was not good. As we have already tried everything in Sir Ganga Ram Hospital in Delhi, we dropped the possibility of my father and my mother as a donor. As you may have already known that my mother was rejected as a possible donor due to her arthritis. There was also medical complexity in my case as my antibodies are not coming down. After taking all these conditions in view, we decided not to go for transplant as my father and mother as donors. So now we are waiting for a deceased donor. 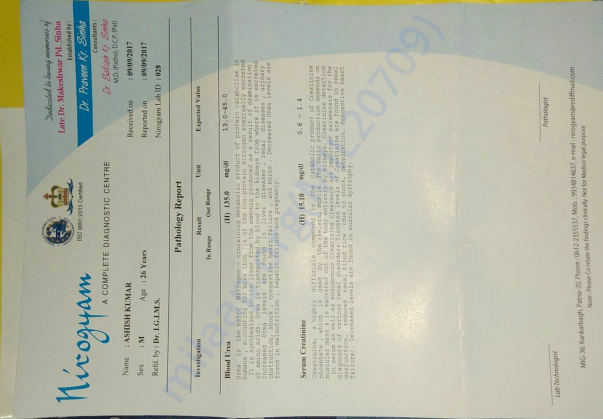 In September when I was in Vellore, I got a call from Indira Gandhi Institute of Medical Science, Patna that there is a deceased donor who wants to donate. They had asked to arrange 8 lakhs and come to the hospital within 4 hrs. But as there was no flight available so that I can reach Patna within 4 hrs, I lost this opportunity to get the transplant. any of them for transplant I would inform you as I would be requiring funds. As of now I am on dialysis and I don't have any job, all the medical expenses are taken care by the funds collected on Millap. Please keep supporting me and sharing the campaign with your friends and family. I am also working on getting a job as a teacher in a school. I am preparing for this. As all you my well wishers know that two months ago I visited CMC vellore to know is there any chance that my father can be a donor. Well the doctor told me that they is a possibility as my antibodies were low at that time. So on Wednesday I and my father is going to CMC vellore to evaluate my father as a donor. If the tests of my father comes as positive, I can get the transplant. Ao for the blood tests I would be needing some funds. First of all a very very thank you for your earlier support. But due to the some antibodies complications in me and medically unfit of the donor my mother I was not able to get the transplant. Now I am in CMC Vellore and after like six months the conditions are favorable as my blood antibodies have come down. Now according to the doctors there is a chance to get transplant. Here my father would be my donor. Now as most of the funds that had been collected last time have been depleted as I was on dialysis and I was unable to get any job. This is also because my health is degrading day by day. Dr has told me that if I don't get a transplant in near future, my health would degrade more and in that case I won't be able to recover again. So I urgently need to take this only remaining chance. 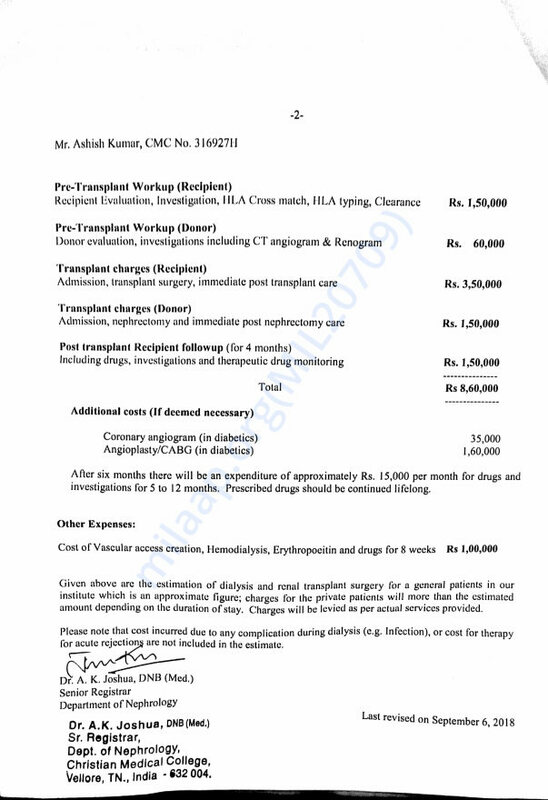 The cost is 15 lac which we need for transplant. So if you would understand my situation and donate once again as you have done earlier I may get transplant and my life would come in track. I have a huge hope in all of you. I know that you won't let be vanish in darkness. You would give me a hope to live with.